The choices for carrying your gear on a tour used to be quite straightforward – panniers for an on-road trip, a seat post system like Topeak Beamrack with a rucksack for off-road. But the development of bikepacking kit over the last few years has given us lots more options. As my ideal tour involves off-road as well as road riding, I’ve been trying out a combination of bikepacking gear with panniers. 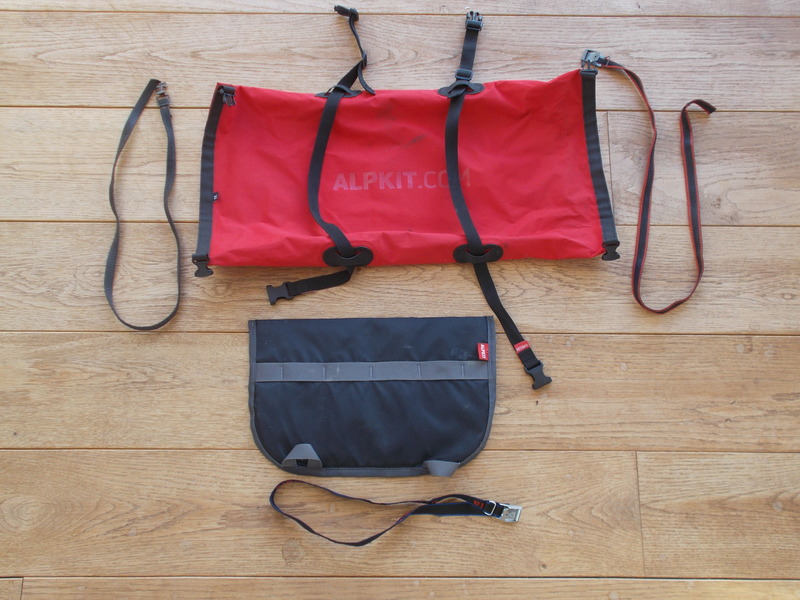 I’ve been using an Alpkit Airlok Dual 13 litre (£15) with the Alpkit Joey harness (£18) on some recent trips so this is a brief review on how I found it. The concept is simple – stuff a dry bag full of gear and then strap it to the handlebars, with the harness providing protection from chafing. I found it worked just as easily as that. I packed the Alpkit bag with my sleeping bag, a down gilet and spare clothes – all things I wouldn’t be using during the ride. Although the bag is waterproof, I lined it with a Exped dry bag for extra weather protection. Roll over and close one end of the bag and leave it closed. Use another 2 straps to secure the bag and harness to the bars plus a short strap to go through the loop at the bottom of the harness and around the frame. In use, it is excellent. I used it on a 1,200 kg trip across Spain about 70% of which was off-road. Once I’d set it up in the morning I never had to readjust or tighten it during the day. I carried about 2 kg of gear in it and it had a negligible effect on the steering. I was using a mountain bike with panniers on the back, bar bag on the front and was carrying about 9 kg in total including camping gear. I’ve tried the Airlok bag on my road touring bike which has 44 cm wide bars. It fits quite securely although you have to slightly reduce the amount you pack in the bag – depending how wide your bars are. 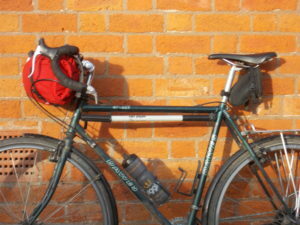 Even so it provides much more capacity that a handlebar bag. The only down side is that you can’t easily ride with your hands on the top of the bars but riding on the brake hoods, drops etc is fine. In conclusion, a simple, well made and great piece of kit which does exactly what it says it says on the tin. 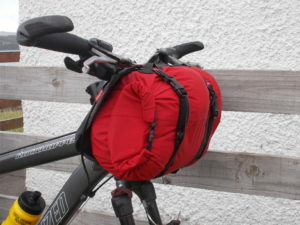 It works well with either panniers or other bikepacking frame/seat bags. There’s also a 20 litre version of the Airlok bag.